Joe has always said “buy your bull from a cow man not a bull salesman." Pairs are sorted for pastures in the spring. The VanNewkirk cows are not pampered, says Joe. "Our place is run just like a commercial cattle ranch; the cows don't know they're registered with mountains of data behind them," said Joe Van Newkirk, of Van Newkirk Herefords in Oshkosh, Neb. 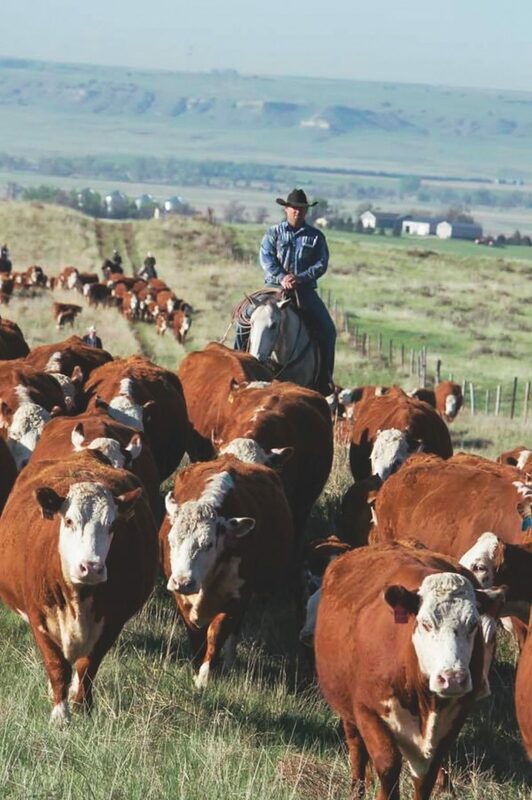 It's that focus on the commercial cattle producer and raising high-quality, performance-backed Hereford cattle that will perform in every environment that has been the catalyst for the Van Newkirk family in building a reputable, trusted seedstock operation. On June 22, Van Newkirk Herefords was presented with the Beef Improvement Federation (BIF) Seedstock Producer of the Year Award at the annual BIF meeting and symposium held in Loveland, Colo.
"The Van Newkirks are a great representation of what a tried and true Hereford breeder is," said Shane Bedwell, American Hereford Association chief operating officer and director of breed improvement. "Their reputation and quality of Hereford cattle have allowed them and the breed along with them to progress. How they cater to the commercial industry is second to none and should be envied by a lot of Hereford breeders." 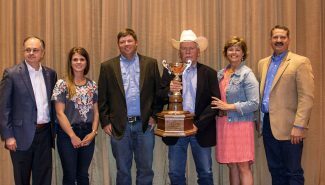 The national award is presented each year to a rancher who seeks to continually improve the beef industry at the seedstock level. The Van Newkirk family joins a long list of highly-respected and long-standing outfits that utilize industry advancements to push their breeding programs forward and reach a level of excellence in the cattle they produce. "The Van Newkirks pay close attention to what their customers want, and those bulls perform well," added Bedwell. "Their sales are the by-product to the amount of focus they have to the industry and their customer base. That's how they maintain their marketshare and their reputation. This is one of the most prestigious awards in the beef improvement arena, and it's a great testament to what the Van Newkirks have been able to achieve as seedstock producers." Van Newkirk Herefords dates back to the late 1880s when John and Lizzy Van Newkirk traveled by covered wagon from Pennsylvania to western Nebraska where they staked their claim to land under the Homestead Act of 1862. One of their nine children — Lorenzo (LD) Van Newkirk dreamed of growing up to become a cowboy. Working for a 2,500-head cow-calf operation called Bratt & Company, LD learned the ropes, and in 1904, he started raising cattle on his own. 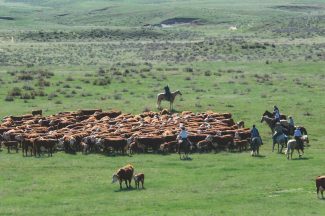 While Longhorns were common fixtures on the range, LD had the foresight to realize Herefords, which were a relatively new breed to the United States at that time, would perform better on the Nebraska terrain. 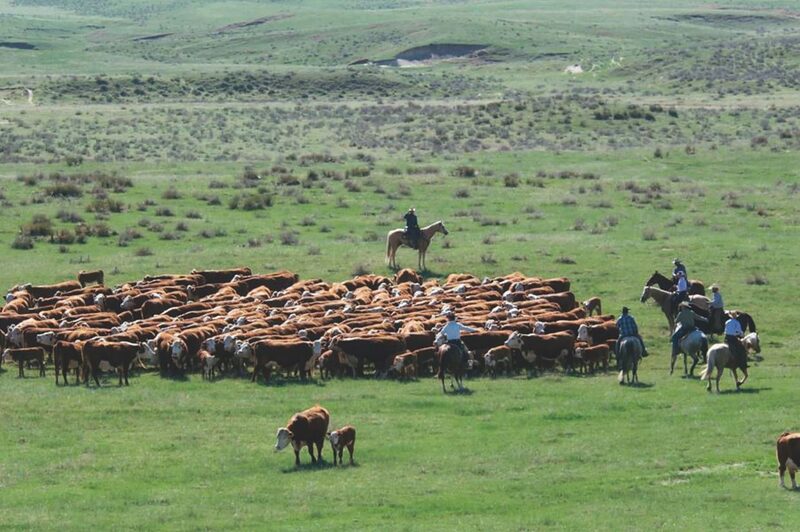 He began crossing his Longhorn cattle with Hereford bulls and immediately realized the improved performance, feed efficiency and growth that could be achieved with the cross. Following in LD's footsteps was his son AJ (Bud), who purchased his first four registered Hereford females in 1942. Passionate about the breed, AJ was active in the Hereford Association in Oshkosh and sold his Hereford Bulls at the Garden County Hereford Association Sale in the 1950s. Presently, Van Newkirk Herefords is operated by Bud's son Joe, and his wife Cyndi; son, Kolby and wife, Meg, and their children, Barrett and Sloan; son, Nick; and daughter, Sara; along with longtime hired man Travis Kezar. Starting from those original four females purchased by Bud in the 1940s, today the ranch is home to 600 registered cows. The Van Newkirks merchandise more than 210 bulls and 260 heifers at their sale each year. Their 46th annual sale is set for Jan. 21, 2019 on the ranch near Oshkosh. The Van Newkirks' widely recognized U Lazy U Van Newkirk brand was acquired by Bud in 1943. Those original pedigrees are the cornerstone of the successful horned Hereford ranch that so many cattlemen recognize and respect today. "My dad did a good job in the early years of keeping the right cows and heifers and building a strong herd foundation," said Joe. "The first bull I ever remember him buying was a CK Fortune bull from the CK Ranch in the early 1960s. In the late 1960s, we needed more performance, so we started weighing the calves and kept the ones that gained the most and proved to be the most feed efficient." Joe says starting to collect weights was huge in advancing their breeding program forward, followed by the development and use of EPDs in the seedstock industry. "Without weights, nothing else matters," said Joe. 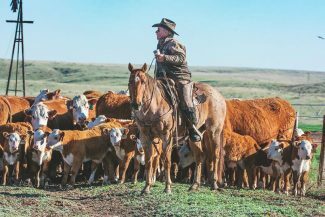 "We actually started collecting weaning and yearling weights first; it wasn't until continental breeds started to gain popularity and birth weights became and issue that we started collecting birth weights, as well." "The advent of EPDs has probably improved our operation the most in the last 50 years," added Cyndi. "And today, with genomic EPDs, our data is more accurate, especially given the size of our contemporary groups, and that has allowed us to carefully select and make meaningful changes to produce bulls that work for our environment, as well as for our customers." From artificial insemination, to collecting ultrasound data, to selecting the best bulls in the breed they can find, the Van Newkirks are motivated to raise bulls that are sustainable and productive. 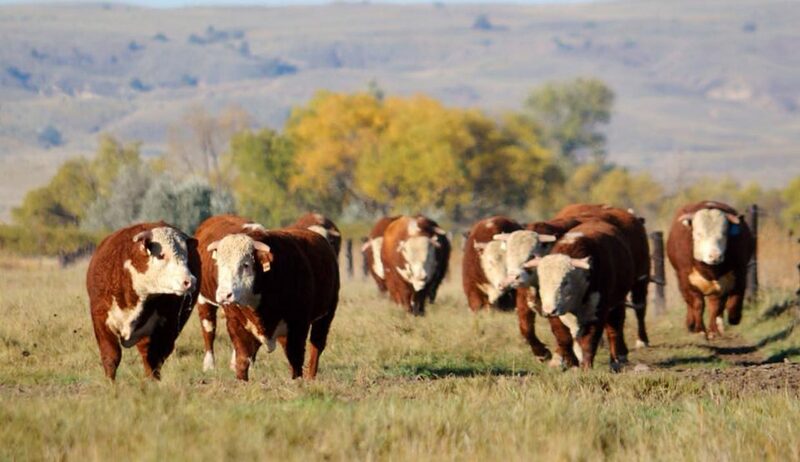 Many of the bulls are sold as two-year olds, maturing on the Nebraska Sandhills for nine months out of the year. Thanks to center pivots and surface irrigation, the Van Newkirks produce 90 percent of their winter feed supply, and the bulls, as well as the cow herd, grazing on native pastures (as well as crop residue after harvest) for nine months out of the year. The bulls aren't pampered and are expected to perform in any environment, and as a result, bulls with the U Lazy U brand can be found working for happy, repeat customers in New Jersey, South Carolina, Virginia, California, Oregon, Texas, Oklahoma, Mississippi, Missouri, Louisiana, Illinois, Colorado, New Mexico, Kansa, Nebraska, Montana, North Dakota, South Dakota, Arkansas, Arizona and Canada. "I've been to every bull sale the Van Newkirks have ever hosted, and each year, the bulls get better and better," said Art Handel, owner of Art Handel Livestock Services Bud, and now Joe and Kolby, have always stayed in tune with the times, and instead of chasing show industry trends, they've consistently raised practical cattle for the commercial cattleman that are bred for performance. In the last eight or nine years, the seedstock producer has really started to pay attention to what the Van Newkirks are doing, especially considering what the commercial cow-calf guy is willing to pay. The Van Newkirks are forward thinkers who are open to innovation, and it shows in their breeding program." Passionate about the breed and the entire beef industry, the Van Newkirks have relied heavily on industry advancements to sustain and grow their operation. Their superior genetics and environmental management practices have allowed Van Newkirk Herefords to grow from a handful of females to one of the largest and most successful Hereford ranches in the nation. More than 600 cattlemen, academia and industry professionals were in attendance at the 50th annual BIF meeting and symposium. The event focuses on continually improving the industry by promoting greater acceptance of beef cattle performance evaluation. Through forward-thinking research projects and academic studies, BIF continues to move the industry forward. "Receiving the Seedstock Producer of the Year Award is very humbling," said Joe. "The BIF does a great job of providing purebred and commercial breeders the best tools available to better evaluate their cattle. We appreciate the academic resources for creating practical guidelines that best help us and our customers advance our breeding programs. Not only were the speakers very enlightening but visiting with ranchers in the hallways between sessions was really educational, as well. It's interesting to hear about what other progressive producers are doing, and we really enjoyed attending this meeting." "We want to thank the BIF for doing such incredible work for the industry," added Cyndi. "We are also very appreciative to the American Hereford Association for nominating us; thank you to Jack Ward and Shane Bedwell. And we want to thank BEEF magazine for sponsoring this award." To learn more about BIF, check out https://beefimprovement.org/. Make plans to attend next year's BIF scheduled for June 18-21, 2019 in Brookings, S.D.